Do you want to make Raspberry Juice? Here is an easy recipe to make juice from raspberries. Many people do not like the "seeds" of raspberries, so they want to make "seedless" raspberry drinks, sauces, jams and jellies, and make raspberry juice - minus the seeds! Personally, when making Raspberry Jam, I usually leave all the seeds in the raspberries to make the recipe. Our family is used to eating the jam that way (yes...some of the family members would definitely prefer to have seedless jam), but, remember, even the seeds of the raspberries are healthy! Unfortunately those tiny seeds of the raspberry fruit are large enough to stick in your teeth, but they are usually small enough to pass through a Foley Food Mill. If you are planning on making large quantities of juice, I would highly recommend a mechanical strainer. I own a Roma Strainer which I use to make applesauce. I absolutely love the efficiency of this strainer, and I have personally make hundreds of jars of applesauce using it. You can also purchase special screens for this Roma strainer which are specifically designed to remove the seeds of different fruits, vegetables, etc. Click on the images below for more detailed product information and customer product reviews, all available for online purchase at *Amazon.com. Most electric juicers also have screens that are fine enough to exclude the raspberry seeds, but if you do not own one of these, you can still remove the seeds by using this simple, efficient and low cost method. How do you remove the seeds of the raspberries without a mechanical or electric strainer? The easiest method is to gently heat the raspberries with about equal parts water (according to you desire) to make them tender, and the seeds ready to separate. Then, while still hot, mash them gently with a potato masher to further loosen the seeds, and extract the juice. Next, strain the mixture through cheesecloth, or a special jelly strainer bag (see the examples below), allowing the juice, and some of the healthy(!) pulp to pass through the mesh. Note - if you want to have your juice as clear as possible, then do not squeeze the mixture too much, as that is what will make it somewhat cloudy. For smaller quantities of juice, if you have a metal sieve (as the one in the picture above, or a large metal sieve) that has small enough "screen" so as not to allow any seeds to pass through, that will work very well, instead of cheesecloth. 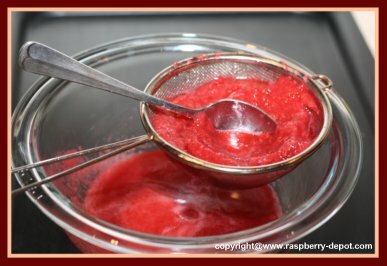 I crush fresh raspberries with a potato masher, (if they are frozen, you can chop them in a blender), and then, with the help of the backside of a spoon I press the mashed/chopped puree through the sieve. If the frozen mixture is too dry, add water. You can consume the healthy raspberry juice as a drink on its own, or you can use the juice as an ingredient in punch, smoothies, or other raspberry drinks!